Greetings such as these ring out at Phelps Architecture, Construction and Engineering (ACE) High School in Northeast Washington, D.C., whenever Mary Jean Pajak, management analyst for AOC's Business Transformation Division, comes to visit. Her efforts have resulted in the AOC being a constant presence at the school since it reopened in 2008, after undergoing a $63 million renovation and the retooling of its curriculum. "My husband, who is an architect in D.C., first brought the school to my attention," says Pajak. "He was volunteering with the local AIA [American Institute of Architects] chapter to create an architecture curriculum for Phelps, and thought it might be something the AOC would be interested in exploring. I then spoke to Architect of the Capitol Stephen Ayers about it, and he gave me the green light to pursue a partnership with Phelps." The AOC's first venture with Phelps was to create and teach an architecture class to first-year students in January 2009. The AOC's involvement has increased over time, with various trades — welding, carpentry, painting, plastering, sheet metal, elevators, insulation, plumbing, heavy equipment, heating, ventilation, air conditioning and refrigeration, electronics and electrical work, as well as safety — getting involved in early 2010. At the present time, 28 AOC employees teach 15 short courses at Phelps during the course of the school year. Capitol Building Sheet Metal Mechanic Mark Focht works with a student during his sheet metal class. "It's been so cool to see how the AOC’s involvement with Phelps has spread to every jurisdiction," says Pajak. "For three years, employees across the organization have shared their talents and expertise with these young people. I think both our employees and the students get a lot out of the partnership." Olatundun Teyibo, the career and technical education coordinator at Phelps, agrees. 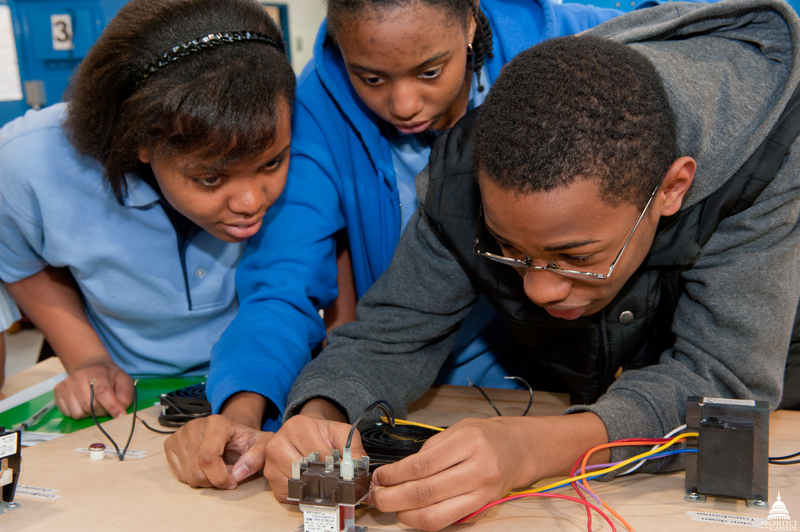 "The students really benefit from exposure to real-life skills and experiences," says Teyibo. "Classes taught by AOC employees are like show-and-tell, but more meaningful — they provide students opportunities to utilize higher order thinking skills and the hands-on activities challenge students to use analytical, creative and practical skills." A 12th grade student, who is in the first class to graduate from the newly reopened Phelps, is grateful for the many different experiences the school has provided during his high school years. "I appreciate the opportunities we have here. It’s opened up a whole new world to me." For one AOC employee, teaching courses at Phelps today is a lot like a classic 1970s television sitcom, minus the crazy bellbottom jeans. James Myers, the work leader in the Capitol Power Plant Insulation Shop, graduated from Phelps Vocational School in 1975 and concentrated in auto body and car repair. From noon until 3 p.m. every school day, Myers would spend time working in an auto body shop as part of his education. At the time Myers was a student, Phelps was also a males-only trade school. "Phelps was very different then — it was very formal," says Myers. "The principal was a former military officer, and he instituted a lot of rules." In 1990, Myers came to the AOC and started working in the Library of Congress Paint Shop. Two years ago, he was asked if he would be interested in teaching courses about heavy equipment and insulation at Phelps. "Since I’m an alumni, it was like that show 'Welcome Back, Kotter,' where the teacher comes back to his old neighborhood and the same school he went to in order to teach," explains Myers. "I've lived in Northeast D.C. my entire life and I’m back teaching at the school I graduated from. Sometimes I get flashbacks when walking around the school’s hallways, even though it’s really changed since I was in school here." Indeed, the physical look of the school has been transformed and the curriculum updated and expanded. First-year students are required to take a survey class that exposes them to each of the eight majors, spending two weeks with each concentration. The sampling of courses is designed to help students choose what their major will be the following year. The goal is to prepare students through rigorous study for college or to command first-rate wages in the construction industry after graduation. "I really like sharing my knowledge with the students and helping them find their calling," says Myers. "When I was a student, others shared what they knew with me, so it’s a great opportunity to give back and guide the next generation." What exactly does the local landmark Ben’s Chili Bowl have to do with electrical circuits? Theon Parker, general supervisor of facility operations at the Library of Congress, happens to know the answer. It's an example he uses to grab the attention of 9th grade students considering the heating, ventilation, air conditioning and refrigeration (HVAC&R) field as a course of study. Parker teaches the class six days per year at Phelps. Students watch as AOC's Theon Parker illustrates the correct and safe method of joining multiple wires together using wire nuts. During the HVAC&R course, students get to practice safe wiring of an HVAC system simulation training board using actual low voltages and HVAC parts. In order to explain the concept of complete electrical circuits during his lesson, Parker created an example he thought the students would remember and understand. "When I teach, I try to relate the curriculum to something they encounter every day and explain how HVAC&R is a part of their lives from the moment they wake up in the morning," says Parker. This is Parker's third year teaching the HVAC&R presentation to the first-year students. "Some of the older kids I previously taught come up to me in the hall and say they remember all about Harry and Harriet." The story of Harry and Harriet is an analogy for how complete electrical circuits work. As Parker explains it: "Harry (power) goes off to work in the morning to his job at Ben's Chili Bowl (electrical load). Once he leaves for the day, he must go back home (neutral) — just like an electrical circuit, which must loop back to its home. But let’s say that on payday Friday, Harry leaves work with his check, takes a shortcut and doesn’t make it home to Harriet. That's a major problem, similar to an actual electrical short circuit." When Parker teaches, he's not only helping students learn about HVAC&R systems, he is also trying to convey the skills and characteristics that they need to develop a career. "I've always felt that 'Each One Should Teach One' — meaning that it's my duty to pass my skills on to someone else, like others did with me when I was young," says Parker. Parker truly relishes the opportunity to teach. He’s been a football coach for 20 years and over the past five years has coached 9th and 10th grade students at Charles Herbert Flowers High School in Prince George’s County, Maryland. "It's a challenge to take a group of individuals at the beginning of the year and mold them into a team," says Parker. "But it's incredibly satisfying to work out a play on paper and then see the kids implement the play on the field, just like you’ve planned." Parker's not just teaching football techniques on the field, however. He is also teaching life skills, the same skills he tries to include in his courses at Phelps. 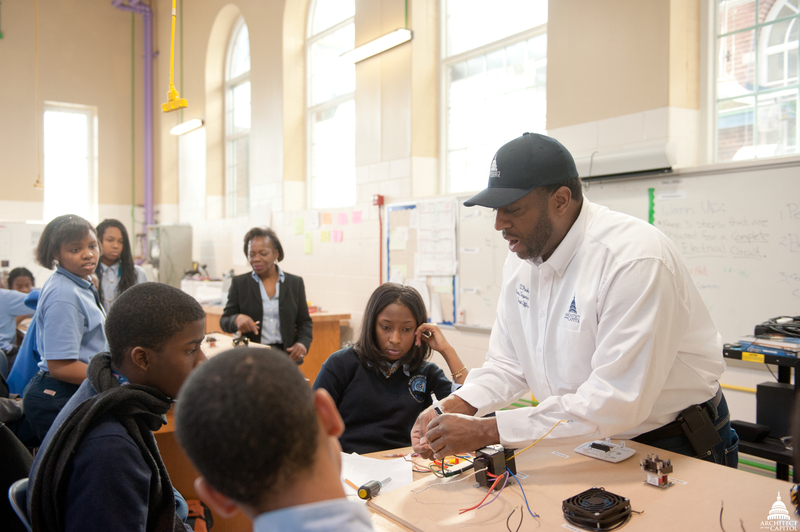 AOC's Eugene Poole teaches students at Phelps High School about architecture by using the array of impressive buildings the AOC cares for on Capitol Hill as examples. Similarly, when AOC Project Manager Eugene Poole teaches the Orders of Architecture class at Phelps, he tries to impart insights beyond what is in the curriculum. During a recent classroom experience with mostly first-year students, Poole encouraged his students to "have a passion for what you do in life — if you don’t have a dream, life will pass you by." The Orders of Architecture course was developed four years ago by a team of architects in AOC Planning and Project Management (PPM), including Project Manager Marilyn Wong-Wittmer. "The course links the past to the present and future of architecture with knowledge of classical architecture — similar to what we do here at the AOC," says Wong-Wittmer. The lesson plan is split into three sections: students first hear a presentation about the five orders of architecture, showcasing examples from Capitol Hill; then they take a test to measure what they learned; and finally, they complete a hands-on activity where they make their own column design. AOC's Tove Anderson helps a student with his column design. "We really see a lot of creativity during the hands-on exercise, from Spiderman creations, to using initials, to incorporating the Phelps panther mascot," explains Wong-Wittmer. "But the real thrust of the activity is to get the students to think about what they've learned, realize that it surrounds their daily life, and then to make it their own." During a recent course, Poole gave the students the hands-on assignment with these instructions: "I want to see something with shock value — create something unique and stimulating. Create something that will impress me." One student's column creation in particular stood out for its detail and artistry. It was obvious he had internalized the lesson and put thought into his concept. He titled his drawing, "Striving for Success based on the American Dream." In the years to come, Mary Jean Pajak and Olatundun Teyibo hope to strengthen and increase the AOC's involvement at Phelps. On June 8, 2012, the first class of students will graduate from Phelps ACE High School, an achievement for the seniors as well as for the teachers. Architect of the Capitol Stephen T. Ayers will deliver the commencement address during this historic occasion. "I am honored that I was chosen to speak to these accomplished students," says Ayers. "The future is bright for each of them, whatever career path they ultimately decide to pursue. We hope that this may even include future employment with the AOC." For the AOC, one of the strongest benefits of the partnership is that it increases the pool of potential job applicants, especially for highly specialized trades such as plasterwork. And for the students at Phelps, the courses taught by AOC employees help communicate business culture and expectations, as well as important skills they can apply to future educational and occupational pursuits. Says Teyibo, "Our partnership with the AOC is critical to our school and especially the success of our CTE [Career Technical Education] program." For Phelps alumni James Myers, "teaching at Phelps is a learning experience for me as well — I’m learning from the students every time I'm there, so we’re learning from one another." He sums up his and AOC's involvement when he says: "It's a joyous and harmonious experience."